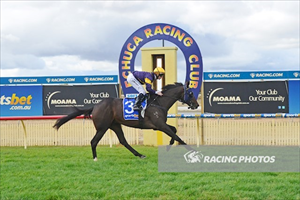 Dodge City broke his maiden in convincing fashion on Sunday in the Quest Echuca Maiden Plate event over 2100m. Stable rider Patrick Moloney gave this son of High Chaparral a lovely ride throughout – making the favourite work for it, Moloney kicked on at the home turn to come over the top of his rivals to win by an easy three lengths. This up and coming stayer does still have plenty to learn and will no doubt continue to take improvement as he matures but Mike Moroney does rate the ability of this son of High Chaparral who now has his sights set on a Derby run; with the first option at this stage looking like it will be in South Australia on 13 May 2017. Dodge City was selected by Paul Moroney Bloodstock from the Kitchwin Hills draft at the Sydney Easter Yearling Sale; carries the colours of Rupert and Cheryl Legh and is owned by a fantastic group of stable supporters. Congratulations to all winning connections R & C Legh Racing Pty Ltd, Carty Racing, Mr M J Everett, Ms S J Nuttall, Mr G J P Van Ameyden, Mr N J Hoar, Mr V Ruiu, Mr G J Sharp, Mr J S Jackson, Mr B D Nettlefold, Pinecliff Racing, Mr G H K Murray, Miss K R Murray, Mr G A Bahen, Ms C J O'brien, Ballymore Stables (Aust) Pty Ltd.